California Poppy Mixed Eschscholzia Californica is a tender perennial that is best grown as an annual. 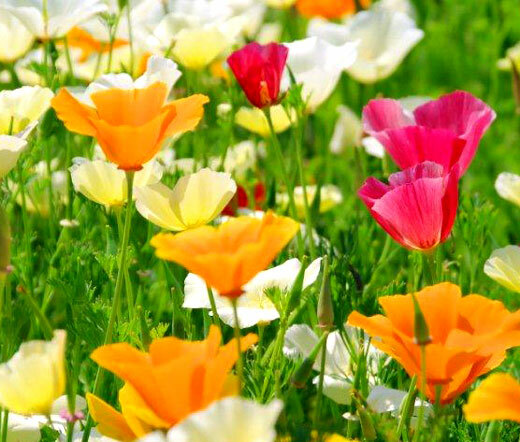 California Poppy Mixed bulk seeds can be sown directly outdoors in spring or fall. Native to California this poppy grows quickly featuring finely divided, fern-like, blue-green foliage and blooming with shallow, cup-shaped red, orange, white and yellow poppy flowers that create dazzling display in the summer garden. The blooming California Poppy attracts bees and butterflies. California Poppy Mixed is widely planted in border fronts, rock gardens, along paths or walkways, pots, and containers. Eschscholzia Californica bulk seeds germinate fast, and the growing plant grows best in full sun accepting various soils including clay. California Poppy is an excellent cut flower that makes a cheerful addition to any floral bouquet. Eschscholzia Californica is drought and heat tolerant.